The European Central Bank has just raised interest rates from 1% to 1.25%, the bank’s first rise in interest rates in nearly three years. This would not normally be particularly noteworthy except for two things. The first is that the ECB is so worried about inflation that it has decided that a rate rise is absolutely necessary despite the fact that this makes life extremely disagreeable for Portugal (currently in line for a €90bn bailout), Greece and Ireland which are struggling with debt, unemployment and sluggish growth worries. The ECB is obliged to tread the middle way at the expense of some of these “peripheral” member states. The second is less dramatic but perhaps of greater importance and that is the fact that the ECB has taken a decision that seems completely contrary to the current policy of the US Federal Reserve Bank. The move makes it clear that the ECB considers the threat of inflation to be the real challenge over the next few years. The Fed has not taken this line which is raising eyebrows as inflation in the United States is currently roughly in line with the Eurozone average so it is clearly a difference in policy between the two central banks which at least since the global recession in 2008 have been working pretty much in tandem. Some say that it is just a question of timing. The economy of the United States is a different beast and is still carrying out a second stimulus programme, the quaintly called QE2, Quantitative Easing Two. So has the ECB moved on or turned a corner that the Fed has not yet reached or do the two economies merely face different bogeymen? The US is still struggling to kick-start a sluggish economy and combat unemployment whereas Europe clearly sees the inflationary dangers as paramount. One of the first results of the ECB’s move will be a rise in the value of the Euro which will displease many European economies which are pushing for export led growth – as the rise in the Euro will make their goods more expensive on the global markets. Why is the ECB so alarmed while the Fed is not? The ECB is reacting to volatility in costs and inflating commodity prices (foodstuffs and oil). This is partly to do with a difference in mandates between the ECB and the Fed. The European bank has the exclusive task of maintaining price stability/fighting inflation whereas the Fed has a wider – perhaps more political role – of fighting inflation and also creating employment. With 2012 a presidential election year and unemployment the key issue, the focus of the Fed will clearly be elsewhere. So why the fuss about the ECB and the Fed parting company? Primarily because it does not happen very often. Traditionally the ECB has followed Fed policy but with a slight lag in time so basically the two institutions worked alongside each other to battle the same demon. This time they appear to have separate demons. 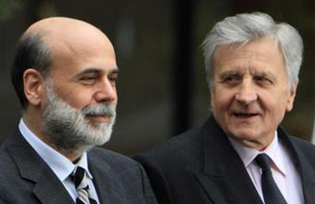 Jean-Claude Trichet made it clear that this modest rate hike was not the beginning of a complete reversal in interest rate policy. Analysts were suggesting that two more similar hikes might be forthcoming from the ECB in the medium term. Trichet denied this vigorously. The real problem is a question of “how it looks”. This is an open display of contradictory behaviour which is the sort of thing that analysts and traders do not like quite simply because it does not look or feel good (it makes a confusing story). They feel like they have to place a bet on one of the two central banks. In reality there is absolutely no reason why the two banks should march to the same step all the time. There could be two winners or indeed two losers. This is economics, there are no certainties. They are fighting different battles in the same arena, end of story.